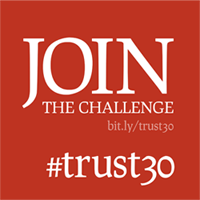 Starting today I am participating in Trust 30 writing challenge. This initiative is inspired by Ralph Waldo Emerson‘s Self-Reliance. Through Self Reliance, one of his classic essays, Emerson reiterated the need for each individual to avoid conformity and false consistency, and follow his or her own instincts and ideas. To celebrate Emerson’s 208th birthday, The Domino Project (TDP) republished Self Reliance on May 25th. This publication is a fusion of old and new. Age old words of wisdom shared by Emerson more than a century ago – combined with inspiring quotes by many of our contemporaries. If you too believe in not conforming to convention then check the details at Self Reliance website created by TDP and commit to the pledge.